Digging, finding, writing about hidden genealogy resources in Iowa. Thus, I walked into the Research Center cold. Once I explained my project Tom Munson (whose photo appeared in the newspaper article) was ready to help. The museum and research center are located in the heart of downtown Sioux City and are obviously part of a downtown revitalization project. The building was formerly a J.C. Penney’s department store. In 2005 the city selected the building for the museum, in 2010 the moving began, and the museum and research center opened in April 2011. The commitment of the city and the abundant space for the museum and research center are enviable. The building offers excellent climate control for the collections. Tom explained that the Research Center does NOT have vital records; these can be accessed at the court house. And, the center does NOT have the newspaper microfilm as this can be accessed at the public library. Still, the holdings of the Research Center are amazing. And the detailed list of the holdings is even more amazing! More than 60,000 items are included on the Subject List which can be found on their website. The list also functions as a finding aid for the staff with subject/title, collection #, and location. The online version is updated about once a year. With over 30,000 black & white photos in the collection, Tom said that many people use the resources here for creating house and business histories. The center also has all of the Sioux City directories that were ever printed (1871-2009), tax registers (1857-1880) and original Sanborn maps (1902-1919, 1924-1948-1968) all of which are also helpful in creating house and business histories. Topical newspaper clipping collections include quality of life topics, i.e., business, churches, and clubs, as well as the people. One collection has more than 600 oral histories that were recorded 1978-1981 and nearly a hundred more that were recorded more recently. Original records include the naturalization records for Woodbury County (1860s-1940s). A resource that I have not seen elsewhere is a collection of Sioux City jail registers (1899-1940s). The Daily Commercial Reporter was a publication that included everything legal that happened in town. 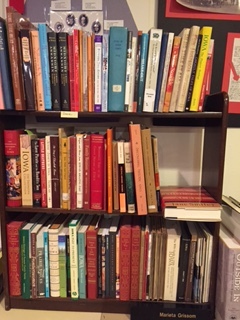 Some volumes (probably 1924, 1925, and 1926) are missing, otherwise the center’s holdings cover 1915-1998; however, this is not indexed yet. Another project waiting to be indexed is a collection of obituaries from the Sioux City Tribune (1893-1907). The center has all of the Central High School yearbooks 1905-1972, about half of the East High School yearbooks, Bishop Heelan High School yearbooks for 1951-2011, and about 70% of the Morningside College yearbooks. While this is not considered a genealogy center Tom said, “If you have family here or family that was ever here, we will have something for you.” I believe it! Aah, Orange City! I had never been there, but I’ve always lived near Pella, an earlier Dutch community. The Dutch settlement of Orange City was established as a colony of Pella. Greta Grond and Doug Anderson were especially helpful as they explained the Dutch heritage of the area. Besides the usual college records, the archives includes a large collection of Tulip Festival scrapbooks covering 1936-1990 as well as other Sioux County histories, memoirs and genealogies. Henry Hospers was the initiator of the group who moved from Pella to Orange City and he was a long-time newspaper publisher. His collection is held here. A digitization project of their collections is continuing and being placed on their website. 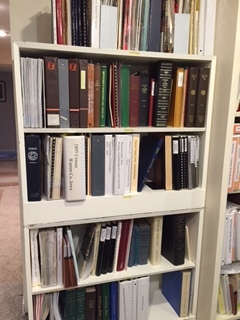 The archives also holds a collection of RCA (Reformed Church in America) church records for disbanded churches in Iowa, North & South Dakota, and Minnesota. Check the online Finding Aids for more information. Another significant piece of information is that De Volksvriend, a Dutch language newspaper founded by Henry Hospers and published from 1872 to 1951, has been digitized and is available online through the National Library of the Netherlands. An explanatory page for non-Dutch speakers and a link to the images is found on the archives website. A helpful article about De Volksvriend is “Dateline Orange City, Iowa: De Volksvriend and the Creation of Dutch American Community in the Midwest, 1874-1951″ by Robert Schoone-Jungen, Annals of Iowa, volume 69, Summer 2010, pp. 308-331. This newspaper is particularly significant because it served as a communication hub: correspondents from many other Dutch settlements used this newspaper as a means of communicating with each other. I don’t usually purchase books during these visits since it could break my budget, but this time I purchased Images of America: Orange City by Doug Anderson, Tim Schlak, Greta Grond, and Sarah Kaltenbach (Charleston, South Carolina: Arcadia Publishing, 2014). Filled with many photographs, it is very helpful for understanding the community and the heritage. Before we left town we had eaten our picnic lunch in the Windmill Park and purchased Dutch letters and three different kinds of meat. Everyone we met in the park, in the shops and at the college seemed so genuinely welcoming. All in all, it was a delicious experience! Recently I had the opportunity to visit with Wilma J. Vande Berg in the genealogy alcove at the public library. And, I agree with the people who told me that Wilma is the “know-all” person for Sioux County genealogy! Let’s go back a little, to July 2003. because it is amazing this genealogy area even exists today. In July 2003 someone threw lighted firecrackers into the book drop and burned the library down! Fortunately, the genealogy materials were in the basement in a vault-like room surrounded with concrete walls. Soon after the fire was extinguished the genealogy file drawers were pulled from their cabinets, piled into a trailer and hauled to Wilma’s walkout basement where she worked with fans and ventilation for months to remove the odor. In the meantime, the city had bigger problems: salvage what they could and build a new library. Wilma said that approximately 50,000 books were sent to Chicago in refrigerated trucks to be freeze-dried and restored. I liked the way the genealogy area is arranged: work tables and chairs in the center with shelves of genealogy materials on three sides and filing cabinets along the fourth side. The area is welcoming and well organized. It also shows a dedication of the library (and by extension, the community) to the needs of genealogists–to preserve the past. Wilma showed me the vertical files with about 9,000 surname files, very impressive. She said that when researchers come in they can usually find their family name in these files. 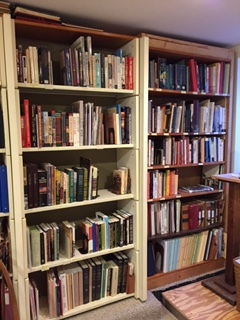 Organized onto the shelves and tucked in an archival storage area are many other items of interest: WWI and WWII soldiers, photos, original newspapers, family histories, newspaper indexes, etc. Be sure to check the website for a more complete listing of their holdings. She showed me their marvelous DRS 3000 Digital Retrieval Workstation that loads microfilm to a computer where it is viewed on a computer monitor. The images can then be zoomed in or out and lightened or darkened, as needed, and sent to a printer. Later I did an internet search for this system and discovered that this specific one is no longer made. However, I recommend that other genealogy or historical groups investigate this kind of option. As I’ve traveled around the state a common comment has been that “we can no longer get parts to fix our microfilm reader/printer.” I was certainly impressed with the workstation concept. Many Sioux County newspaper images can be accessed through http://siouxcounty.newspaperarchive.com, however, the public library board is working with another company to move the images to a site which should be less prone to problems. GSCGS certainly has a dedicated group of volunteers. It is always nice to see such a group effort. Wilma said they have anywhere from six to ten people who come on Wednesday afternoons to work. They work a while, then have coffee! She also has several people who are working on a project to post obituaries onto their website. Currently they have about 23,600 obituaries online adding about 500 more every month. Besides the dedication of so many volunteers, the website is the real hidden treasure here. It is nice how GSCGS is using something already in existence, the USGenWeb/IAGenWeb project instead of creating a new website for researchers to find. There can be real advantages to “one-stop shopping.” As I tried to use their website, however, I had difficulty finding the huge obituary collection; then I saw it… the obit icon on the left side of the screen! So obvious, but I couldn’t find it. Be sure to dig… you may be surprised at everything you will find. Continuing my sorting of Mom’s collection, I have found nearly a paper box full of high school and college yearbooks. What to do with these? I am going through each one looking for relatives. When found, I photocopy the page(s) as well as any related pages and title page, and place in the person’s hanging file. This has been very interesting, especially reading some of the one-line comments with the photographs of the seniors. One of my favorites was for my mother’s brother, “Because a man doesn’t talk is no sign he hasn’t something to say.” (1) This apparently describes a personality trait for an uncle I never knew (he was a pilot and killed in China in an plane crash near the end of WW II). My brother is also very quiet; a family trait? I’m going to donate these yearbooks to the Iowa Genealogical Society, as they are just starting a collection of yearbooks. Yearbooks may provide unexpected color for an ancestor’s biography. (1) Howard Butler, Indianola (Iowa) High School Pow-Wow, 1935, p. 9. (2) The Pow-Wow of Indianola (Iowa) High School, Volume Nine, 1923, unnumbered pages, joke pages were near the back of the book.